We were awaken at 4:20 this morning by a loud noise in the living room. It wasn’t the kind of noise that wakes you up and you lie there and think, “Hmm, I wonder what that was.” This was a sit straight up in bed and yell, “Holy S%#!, What the H*#! was that? !” kind of noise. Rose thought Puck jumped up on the china cabinet and knocked her porcelain stocking holder down… again. Unfortunately, that was not what happened. We got up to discover our Christmas tree lying on its side and Chris and Puck standing next to it like they were as surprised as we were. I don’t know who was responsible but those two tend to get frisky during the night and take turns chasing each other around the house. I’m sure one chased the other into the tree. This was not how we wanted to take down the tree. We planned on getting a plastic box or bag designed for Christmas trees since I threw away the box it came in (the glue attracts cockroaches), but yesterday was Rose’s birthday and she didn’t feel like dealing with Wal-Mart, the only store near us that would carry such an item. I didn’t blame her, Wal-Mart is always a huge hassle. The first thing we had to do was get as much broken glass up as we could before someone cut their foot. I missed a piece that Chris found and picked it up and started chewing on it. I tried to get him to drop it but he wouldn’t so I had to pick him up and shake him until he let go. Later, when we picked up all the candy canes, we discovered many had been chewed on. I think Chris was chewing on candy canes while we were putting ornaments away. Perhaps he thought the broken glass was part of a candy cane. If there are any readers out there that have never had children and are considering it, I would suggest you get a couple of cats first for practice. 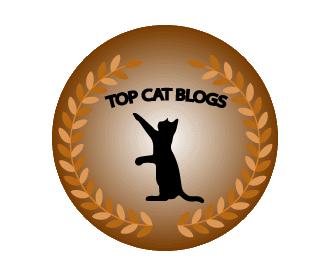 This entry was posted in Uncategorized and tagged bad cats, broken ornaments, candy canes, Cats, Christmas Tree, crash, loud noise on December 30, 2013 by Charles Huss. I think the “mysterious” tree fallings are quite common. Next year I am goung to connect it to the wall somehow. I’ll try that fear of death thing but I don’t think Chris gets it. He is very smart but at the same time cannot learn to change his behavior. Oh, you are so fortunate your tree remained upright as long as it did. We don’t even try to put one up in our house. Every year I argue for using our 18 inch porcelain tree as our main tree but the boss (Rose) won’t hear of it. Now that’s what I call a “rude awakening” !! Thank heavens nobody was hurt (except obviously that broken glass could have been a disaster for sure) but what a scare that had to have been. 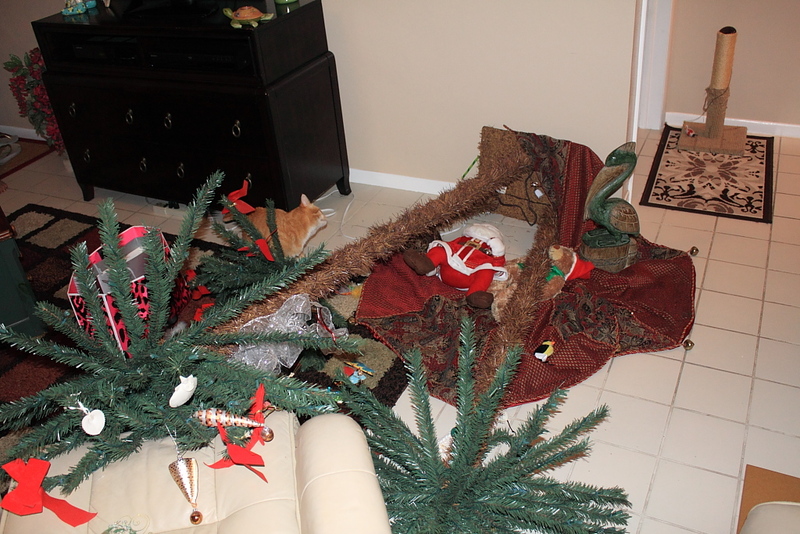 You have a whole year to figure out some safe way to secure the tree before next Christmas rolls around…..GOOD LUCK!!! Thanks. I think I will try to anchor it to the wall next year. I can’t wait until technology allows me to put up a hologram tree. I should have learned that lesson by now. That is a good point. 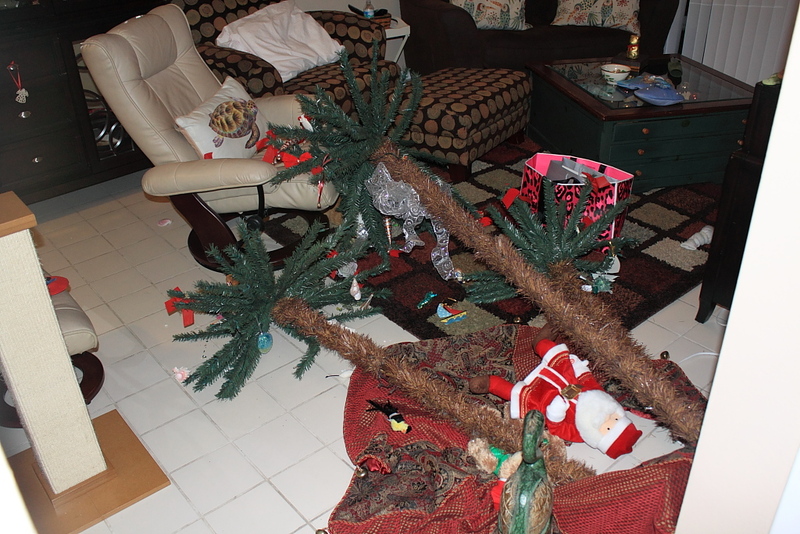 If the tree had fallen while we were at work, things could have been very bad. I wanted to get a little tree (or just use our little porcelain tree) but my wife would not hear of it. At least it wasn’t a real tree with water in the base! Our Autumn knocked down a real tree last year. We had a flood. I can see how that could be a problem. Did you have a real tree this year? Oh, no! Two years ago, our tree fell down a LOT. It scared most of us, all but the two who kept climbing it. 😉 Last year, though, no one bothered the tree at all. This year, we didn’t even have a tree because we have a 1-year-old foster cat (read: kitten-like youngster) and didn’t want to deal with it. When our mommy was growing up, her grandpa always anchored the tree to the ceiling and the wall, as well as had it in a floor stand. If it was in the middle of a room, it was anchored to the ceiling and in a floor stand. That helped considerably! Glad you got Chris to give you the piece of glass and no one got hurt! Thanks. I need to anchor the tree next year. Yes you are. We were lucky too up until the other day. It’s been many years since Mom had a kitty knock down a tree. She is thankful for that. This is our first tree knocked over. We usually just have ornaments pulled off. Thanks Fozziemum. I have almost a year to think about it (or forget about it). I’m glad I never tried having a tree in this place! I hope there weren’t too many things broken?